Dr. Ananda Bhavanani is a medical doctor and director of the Centre for Yoga Therapy Education and Research. There is so much brilliance in this conversation—and Ananda won’t take an ounce of credit for it. He shares how each of us are conduits for universal consciousness and wisdom and that only when we attempt to take ownership for that insight do we get blocked from its transmission. Uma Dinsmore-Tuli is the author of Yoni Shakti: A Woman’s Guide to Power and Freedom Through Yoga and Tantra. She shares how the “freedom” to be someone else, to be who society tells us to be or what social media tells us to be, is not freedom at all. The power that is unleashed when we accept who we really are (including our many evolutions and manifestations) is potent beyond measure. Hear Uma’s interpretation and understanding of what freedom is and how simple allowance and acceptance translates into profound inner strength and power. For more of Dinsmore-Tuli’s work, resources and books, visit www.umadinsmoretuli.com and www.yonishakti.co. Julie Wiebe is a renowned physical therapist, course educator, pelvic floor advocate, writer, and mother. Learn what matters most to Julie at the end of the day, what moves her success metric and ultimately guides her course. She shares how she tries to “eliminate the things that no longer bring joy”—simple wisdom that’s not always so simple to implement. Julie is staying true to her words by transitioning her career to focus on research and letting go what is less of a priority for her and her family. She continues to offer online and onsite courses, YouTube videos and blogs. To learn more, visit www.juliewiebept.com. Humility and Self-Confidence Aren’t Mutually Exclusive! Marion “Mugs” McConnell is one of Canada’s pioneers and leaders in yoga. She has been practising for 45 years, since the early 1970s, and teaching for over 40. Discover the most important thing, without question and without pause, that yoga has given her and how she puts that into practice when she’s teaching (sometimes in front of hundreds of people)! For more information on Mugs’ long-standing yoga teacher trainings, visit www.soyayoga.com. 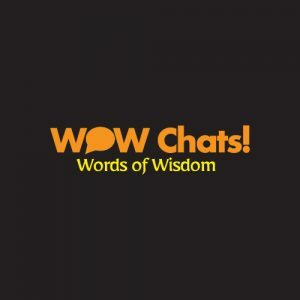 Check out Part 1, Part 2, Part 3 , Part 4, Part 5, and Part 6 compilations or the FULL PLAYLIST HERE for more insightful and fun W.O.W. Chats! !